Explore and discover the amazing beauty of the Great Barrier Reef with this fun-filled adventure to Bait Reef. Explore's Full Day to the Outer Great Barrier Reef is an ideal way to see one of the world's greatest natural wonders. This trip is ideal for all types of adventurers with both scuba diving and snorkelling on the agenda. Discover all the reef has to offer at two different dive sites, where you will get to witness the vast marine landscapes, colourful corals, beautiful fish and even inquisitive sea turtles. 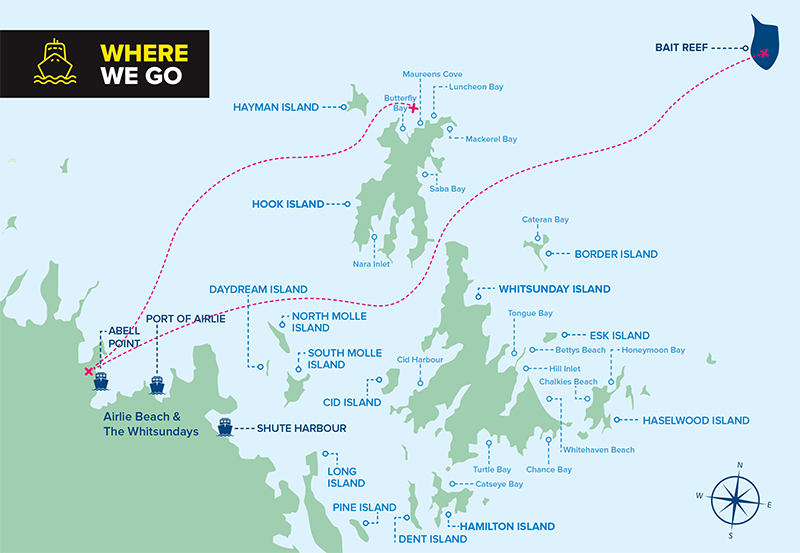 Bait Reef is the closest Outer Reef to the Whitsundays and provides amazing individual reefs for snorkelling, scuba diving and exploring. You will cruise out on a comfortable and purpose-built vessel, which has plenty of space for relaxing during the ride. It has two levels of air-conditioned luxury as well as shaded outdoor areas to ensure you get to enjoy maximum comfort during your journey! It will have everything you need for your day on the reef, and is an ideal place from which to explore the Great Barrier Reef Marine Park and all its wonders. The back of the boat even has a full beam swim platform to make getting and out of the water easy and comfortable. You will be served a buffet lunch during your trip, as well as morning and afternoon tea to keep you energised and ready to go! Both snorkelers and scuba divers are welcome on board, where they will get to spend at least 3.5 hours on the reef, getting up close with the amazing marine life, coral gardens and colourful fish. Your full day tour to the Outer Great Barrier Reef offers the perfect opportunity to snorkel on one of the most diverse reefs in the world! With plenty of time on the reef as well as two dive sites included, snorkellers will be able to get a real feel for the reef, exploring its untouched and stunningly wild outer reefs. The shallow corals and diverse marine life provide a kaleidoscope of colour that will leave you in awe and wonder! Scuba divers will get to participate in two dives during their day with Explore, making their way to two different dive sites! The diverse reefs provide the perfect place from which to explore all that the area has to offer as you are guided around by your divemaster or instructor. Divers will be immersed in the amazing underwater gardens of the Outer Great Barrier Reef, getting up close with all the marine life that lives there! Includes one dive only and one snorkelling session. A second dive may be available depending on weather conditions and time at the reef, for an additional cost of $59. As some of our location at Bait Reef are advanced dives, if your last dive was more than 12 months prior (and depending on the total number of dives) we may require you to complete either a PADI ReActivate Programme or a refresher programme in the pool prior to diving. Please discuss at the time of booking for more details. Those undertaking a refresher programme, or Introductory dive will need to complete a 1-hour pool session prior to departure. Please enquire for more details. Price per person includes GST and $6.50 Reef Levy. Alcoholic beverages, soft drinks & snacks can be purchased onboard. If a PADI ReActivate Programme or a refresher programme is required these are at an additional cost. Please enquire. Those undertaking a refresher programme, or Introductory dive will need to be in Airlie Beach the day prior to departure to complete a 1 hour pool session. This session usually occurs between the hours of 1pm - 3pm. All certified divers must produce their certification card or log book at the time of booking. As some of our location at Bait Reef are advanced dives, if your last dive was more than 12 months prior (and depending total number of dives) we may require you to complete either a PADI ReActivate Programme or a refresher programme in the pool prior to diving. Please discuss at the time of booking for more details. All client cancellations forfeit 25% of total ticket price and all client cancellations made less than 7 days prior to departure will result in complete forfeiture of the full price of the tour. If the tour operator has to cancel the trip (prior to the departure) and we cannot offer a suitable alternative, then a refund will be given minus card fees. In the event of a missed departure, Explore will not be held responsible and the guest will forfeit 100% of the tour fee. Departure times are final. We strongly recommend that you have travel insurance, especially during the wet season. 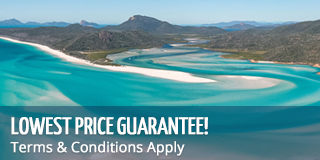 Thank you for booking with Mr Travel/Sailing Whitsundays.